What does "Maltagliati Integrali" mean? 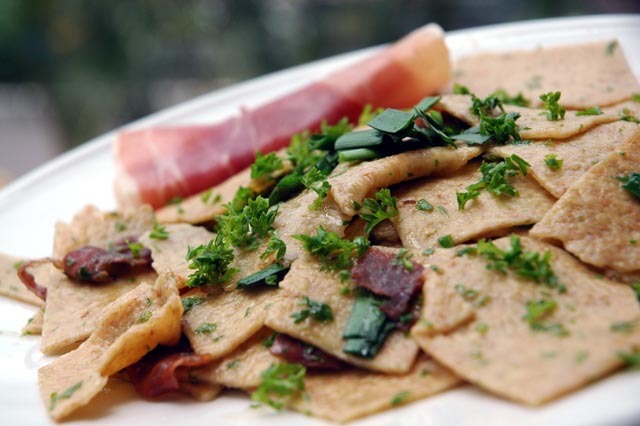 "Maltagliati" means "badly cut", while "Integrale" means wholemeal in Italian. 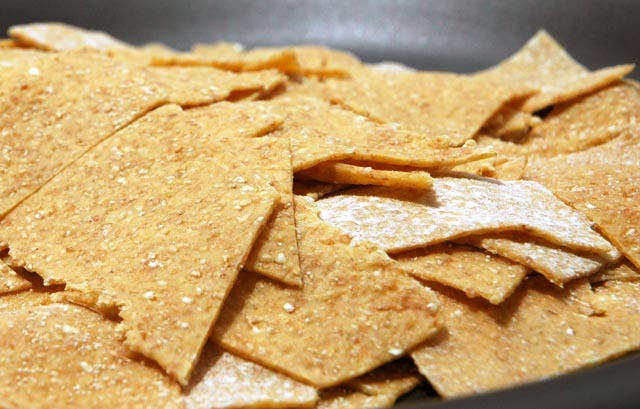 This is a very rustic recipe, with rough textures and flavours. I suggest for this recipe that you mix 70% of plain flour with 30% of wholemeal when you make the dough. As usual, 100gr of flour for 1 whole egg, a little salt and a dash of olive oil. Mix the flour with the egg, salt and olive oil, kneed the dough for about 5 minutes and let it rest for 30-40 minutes. 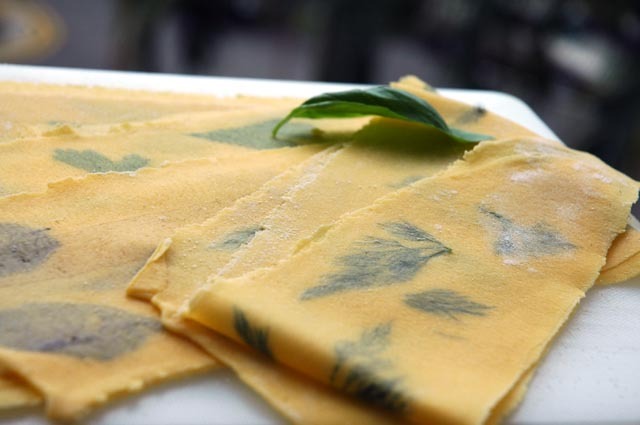 Finally, flatten the dough into pasta sheets, preferably thicker than usual (probably a 5-6 on your pasta machine) and cut them with a kitchen knife into irregular shapes. To make the sauce, I used Parma ham instead of pancetta as I am unable to find pancetta in Singapore. Unfortunately using Parma ham is an expensive alternative, but you can use the cheapest raw ham that you can find (Serrano or similar). Cut the ham into pieces, and wash and chop some fresh parsley and chives. Crush 3 cloves of garlic. Fry the garlic in a large pan with some olive oil, add the ham and cook it until crisp, then pour some red wine and let it evaporate. Remove from the fire, and add 2 cubes of beef stock (previously prepared, see my recipe). Cook the maltagliati in boiling water for a minute or so, drain them in a colander, add them to the pan and put back on the fire. Add half of the parsley and chives, saute' until the stock incorporates (no longer than 1 minute) then serve on a plate and top with the remaining chives and parsley. 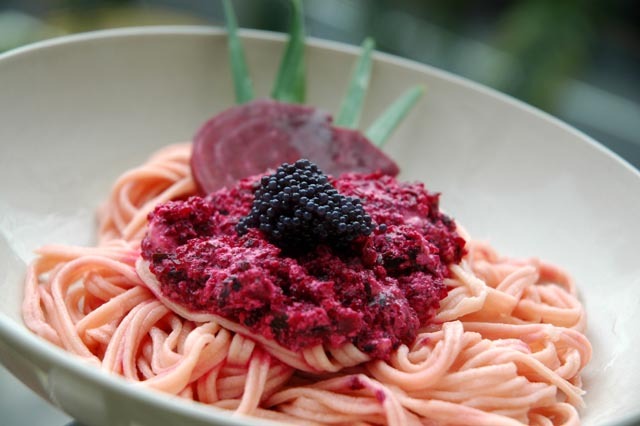 A quick and easy recipe, if you want to cook something different, for fresh tagliolini lovers who got bored with making the usual tomato sauce. Boil a beetroot in salted hot water for 30 seconds or so, remove it from the heat and peel it. Reserve a couple of slices for decoration purposes, and place the rest in a blender together with a few strands of fresh chives. Quickly blend them together, then transfer them into a skillet, adding some cream to taste. Reduce the cream to a half, then add salt and pepper and a few extra chopped chives. Remove from the fire. Quickly boil the tagliolini and serve with the sauce on top. I also added some caviar for extra flavour and decoration. I never use MSG and never will. I took the opportunity to prepare some beef stock that I can use for my future recipes. 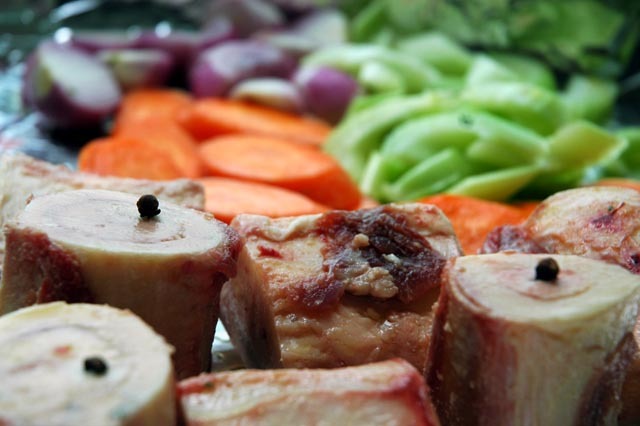 This is not something you can prepare "ad hoc" when you need it, due to the long preparation time, but you can easily prepare it while you are cooking something else, and freeze it for months so you won't have to do this again for quite a while. Luckily, I managed to get hold of some marrow bones purchased at "Espirito Santo" at Parkway Parade. I placed them on a baking tray with some roughly cut carrots, celery, onions and a halved bulb of garlic. I planted a few cloves into the bones, and drizzled the ingredients with some olive oil before putting the tray into an oven heated at 220°C. 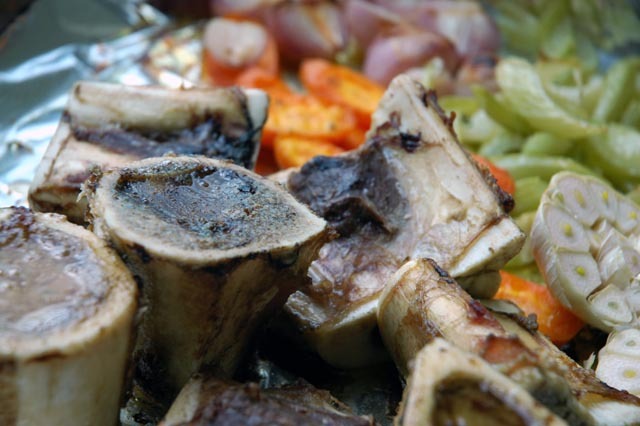 After 30 mins or so, when the bones were nicely browned, I removed the contents and placed them into a large saucepan, together with a "mazzetto aromatico", or a selection of herbs including sage, parsley, marjoram. I topped the content with a couple of bay leaves and some whole peppercorns, extra carrots, celery and fennel. Finally, I placed the pan on medium heat and covered the ingredients with cold water. Once the water starts boiling, remember to adjust the heat to keep it on a slow simmer, and let it continue for 2-4 hours, topping with extra water when necessary. After about 4 hours, I removed the pan from the fire, and let the stock cool down for about 10 mins. I then filter the contents, separating the juice using a very fine colander and squeezing the vegetables to extract every bit of juice left. 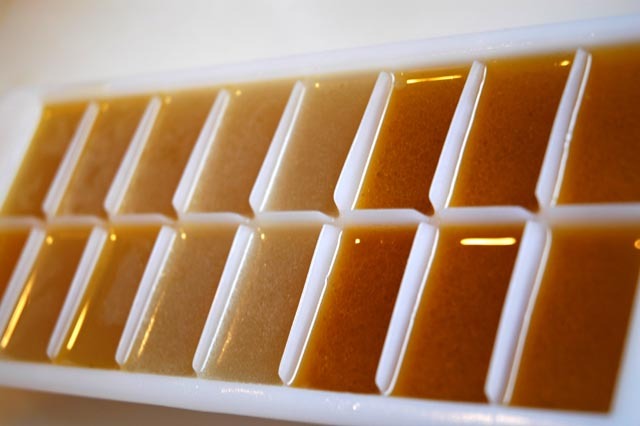 Finally, I placed the content into ice cube containers for freezing. Unfortunately, it's not that easy to remove stock cubes from these containers due to the oily nature of the stock. I would rather use ice cube bags, however I have not been successful at finding these in Singapore yet. 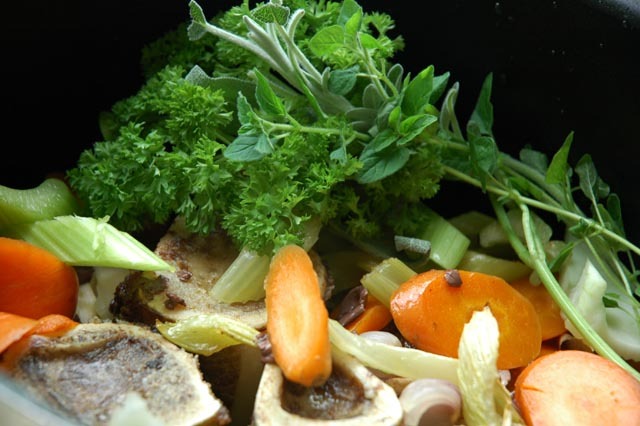 You now have a delicate, tasty and natural stock which you can use for future recipes! 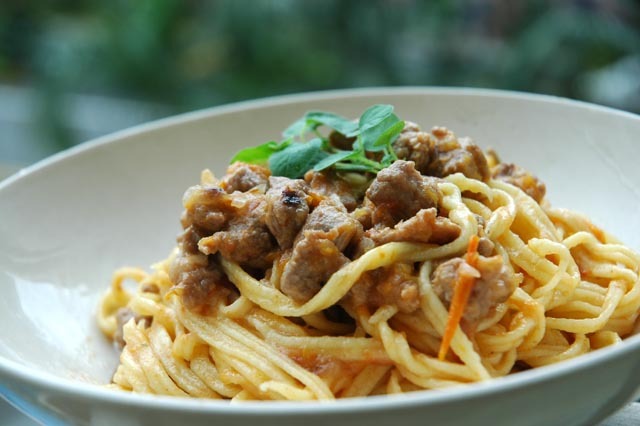 This is a quick and easy recipe if you would like to make fresh pasta with meat. Lamb can be easily replaced with sausages or beef. 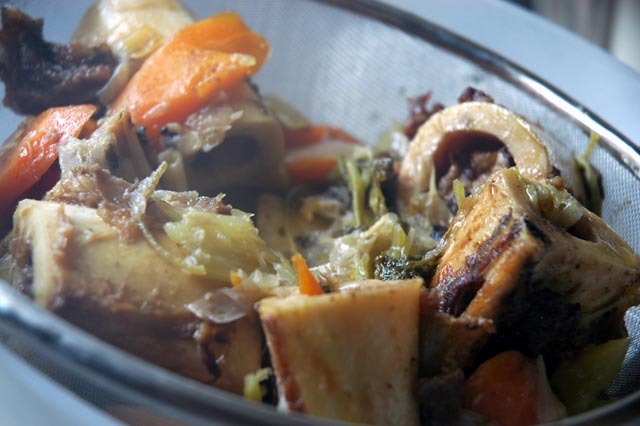 Preferably, you will have previously prepared some lamb or beef stock that you can use for this recipe. 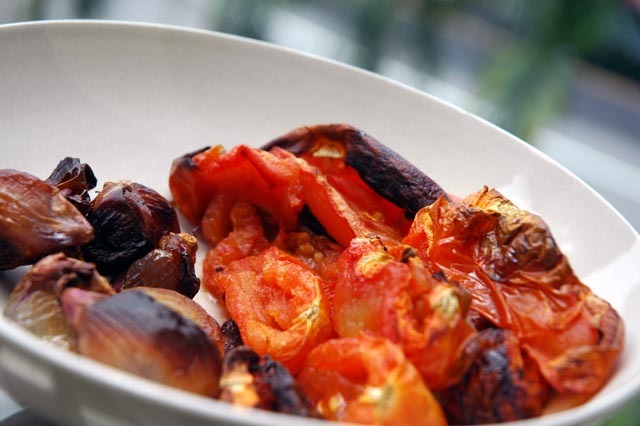 Heat an oven at 200˚C, and on a baking tray place some small onions and tomatoes, cut in half and seeds removed. 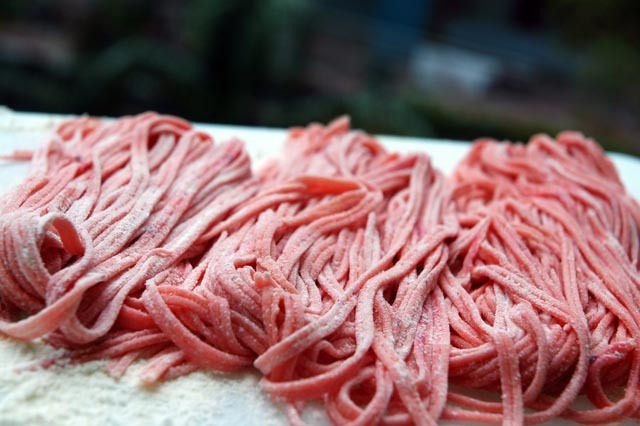 In the meantime, prepare the dough for your tagliolini, let it rest and make the tagliolini. 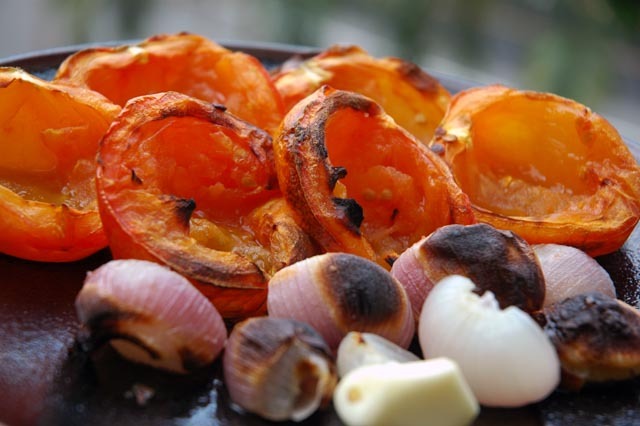 When the tomatoes are roasted, remove from the oven and pass in a food processor. 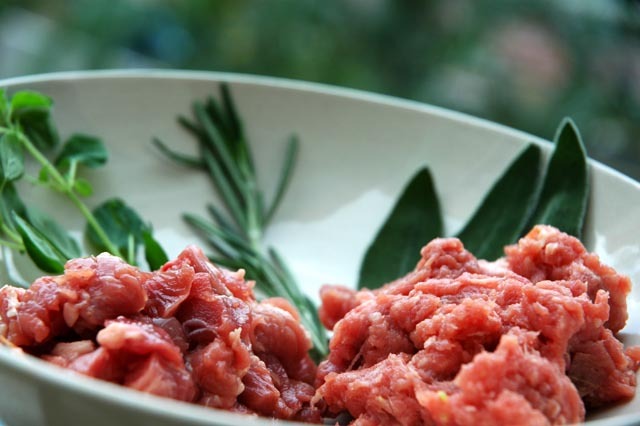 Mince some lamb in a food processor, and prepare some leaves of sage, rosemary and parsley. Finally heat up a pan, add a dash of olive oil, fry some garlic and add the herbs followed by the lamb. Fry until it browns, then add some white wine. Once the wine is evaporated, add the tomato mixture and some optional stock, then salt and pepper to taste and continue to cook for 30 seconds or so. Add a pinch of grated orange zest, mix, cover and remove from the fire. Rapidly boil the tagliolini, top with the sauce and serve. Gnocchi in tomato sauce is one of my favourite combinations and it's the perfect hearty dish for a Sunday lunch. 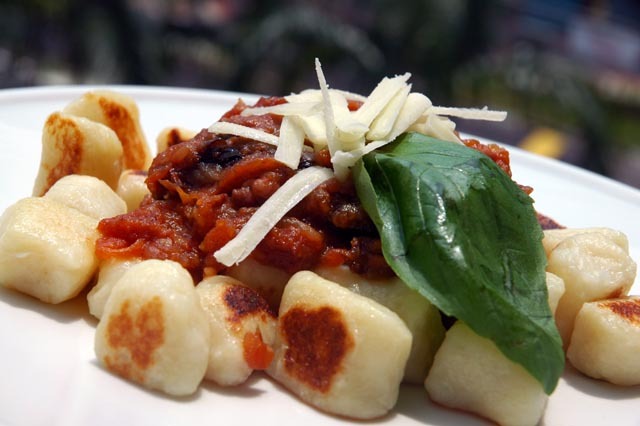 Gnocchi is fairly easy and inexpensive to make, and the homemade version tastes a world apart from the industrial made ones. This recipe serves 2 people. Scrub 3 large potatoes leaving the skin on. It is important that you choose "old" potatoes, rather than new ones, as they are drier and more floury and will result in a less sticky dough. Halve 4-5 medium sized tomatoes and remove the seeds. Peel a few shallots (about 7-8). Preheat an oven at 180°C, place the tomatoes, the potatoes and the shallots on a baking tray and bake in the oven for about an hour (you might require an additional 15 mins depending on the size of the potatoes). Periodically check the shallots and remove them from the tray half way to prevent burning. Tomatoes and shallots should dry out as shown in the picture. 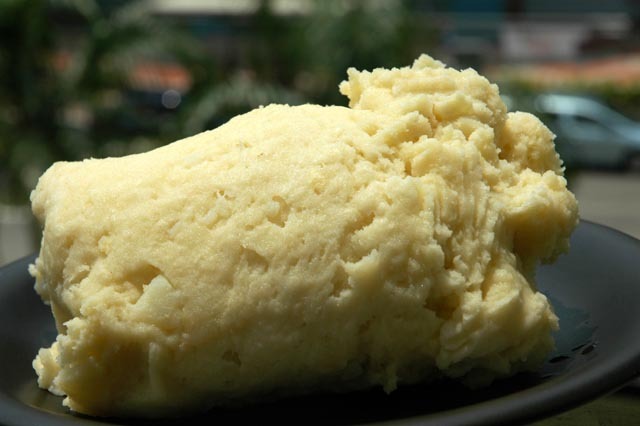 Peel the potatoes from the skin and mash the pulp in a container using a fork. Once nicely mushed, salt and gradually add about 100gr of flour and (optionally) 20gr of Panko (Japanese breadcrumbs, which can be purchased at any Japanese food outlet). Once the ingredients are uniformly mixed, add about half a beaten egg into the mixture, achieving a smooth, solid paste pictured below. 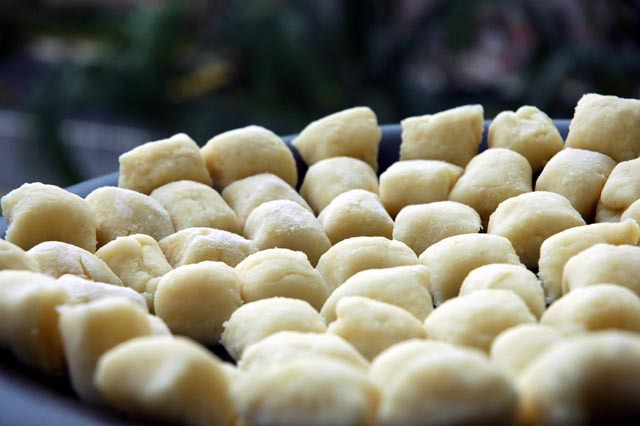 With your hands, roll pieces of dough into 2cm diameter cylinders, and with the back of a kitchen knife, detach the gnocchi one by one into 3cm long chunks. Put the shallots and tomatoes in a blender and quickly blend into a smooth sauce. Fry one slice of bacon, thinly chopped, on a dash of olive oil. Pour a splash of red wine and once evaporated add the tomatoes with a couple of trimmed leaves of fresh basil. Season with salt and cook for about a minute, adding water if the sauce gets too thick. 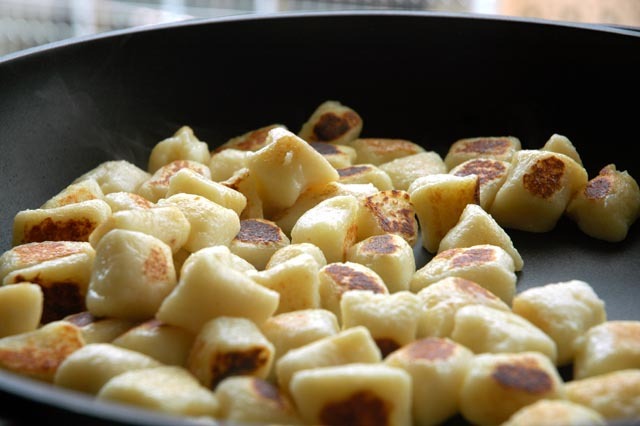 In a large pan, bring some water to the boil, salt it and boil the gnocchi until they raise to the surface. Remove them from the water. Heat a large non-stick pan, pour a dash of olive oil and saute' the gnocchi for 3-4 minutes, until they are golden brown and crispy on the surface. Finally, put the gnocchi on a plate, top with the sauce and garnish with a leaf of basil and some grated pecorino cheese to taste. A Saturday lunch at home with a gourmet craving... the only solution is to try something new that can satisfy the culinary libido! This meal was inspired from ideas shown on "Cook like a chef - Season 3", on the Asian Food Channel. I highly recommend this programme to anyone who loves cooking. As you would expect from any true Italian, I love making fresh pasta. 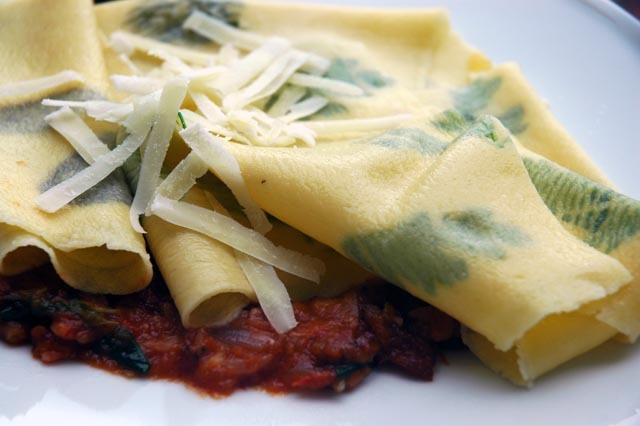 I like the uneven, rustic texture that you can enjoy only with homemade egg pasta. 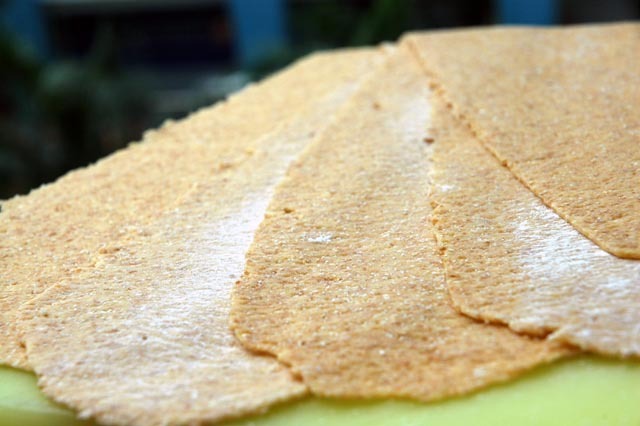 For this recipe, I used 3/4 of regular flour and 1/4 semolina flour to obtain the texture shown on the picture. Apart from that, I followed the classic recipe, with 1 egg for each 100gr of flour. Once the dough is ready and rested, flatten it as you would normally do, lay it on the worktop and randomly position fresh herbs on one half of the strip of dough (try to discard the stems as they tend to break through the dough). Fold it and press the top to stick it to the other side, trapping the herbs in between while making sure you don't create air bubbles by pressing from the middle and moving outwards. Proceed with the pasta machine once again, thinning the layer to taste. I like to make this slightly thicker (about 7 out of 9 on my pasta machine) for this particular dish. Once done, roughly cut the layer into big squares (about 10cm long) as if you were making lasagna. The herbs I used were red basil, dill and parsley. Other herbs can work and look as beautiful. 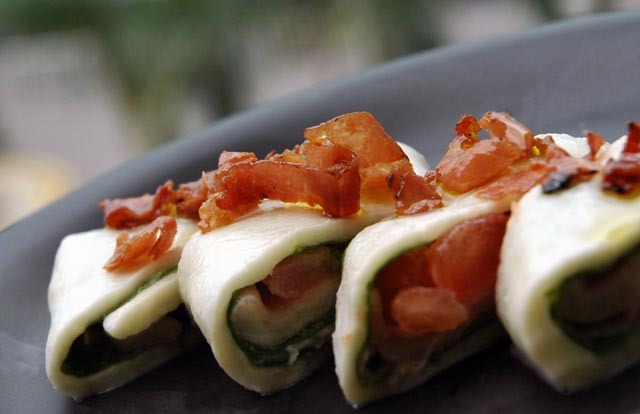 This fresh mozzarella roll is a great, quick appetiser. Peel 2 tomatoes, remove the seeds, chop them and salt them. Cut 2-3 mozzarella's into about 4-6 pieces each, and drop the pieces into hot water (bring the water to about 70-80 degrees). Leave the chunks in the water for about a minute, until it's softened, then remove them and rapidly arrange them on a piece of cling film. With your hands, mould the mozzarella into an even square and top with fresh basil leaves and cubes of tomatoes. For extra flavour, you could also lay a slice of Parma ham. Finally, roll the mozzarella and wrap it with the cling film. Store it into a fridge for an hour or so, until firm and ready to slice at a slight angle. I decorated this dish with some strips of fried, crispy raw ham (Parma ham or similar), and a few drops of olive oil. Coming back to our pasta... time to make the sauce. This is probably the easiest way of making a tasty tomato sauce. Position 2-3 halved tomatoes and 2-3 halved shallots on a baking tray. Grill them in an oven at 200-250 degrees until they are well melted and dried and the surface shows signs of burning (30-50 minutes). Those burnt bits really add to the flavour! Remove from the oven, and put them all into a blender. Mash to taste, fry some bacon on a large pan, and once ready pour the tomato mixture into it, together with a few leaves of fresh basil. Season with salt and a bit of olive oil or butter to taste, and simmer until your pasta is ready. Boil the pasta sheets (less than a minute will be enough), and position them on top of the sauce. Top with some grated Parmesan and serve. 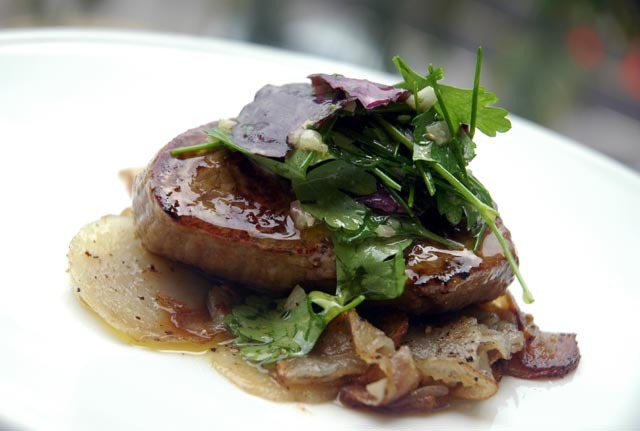 To prepare this beef fillet with herbs, make a French vinaigrette by mixing 3 parts of extra virgin olive oil with one part of wine vinegar. Add some finely chopped shallots and herbs to taste (I used dill, red basil, chives and parsley). Add a spoon of Dijon mustard, salt and pepper and stir with a whisk. Let the vinaigrette rest while coarsely chopping the same herbs to create a herb salad. Pour some of the condiment on the salad and gently toss it. For a smoother flavour, the vinaigrette could be made far in advance. Thinly slice a couple of potatoes, fry some butter and oil on a large pan and arrange the potato slices on top. Cover and let them cook over medium-low heat until the bottom is golden brown. Cook the fillets of beef to taste, salt them and arrange them on a bed of sliced potatoes, top with the herb salad and drizzle with some extra vinaigrette.